Survey Requirements Contracts – KC Engineering and Land Surveying, P.C. PS 52, 178-37 146th Terrace, Queens, NY | Boundary, utility, and topographic survey for playground redevelopment. GPS for NYS State Plane and NAVD 88 Datum, level runs to Borough horizontal and vertical monuments, and BMs for conversion to Queens Borough Coordinate System. 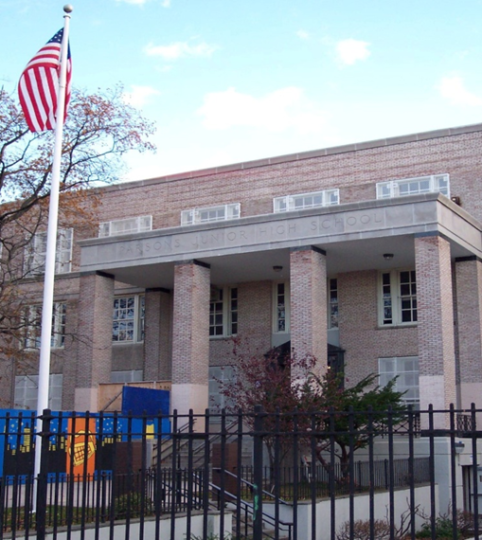 IS 49, 223 Graham Avenue, Brooklyn, NY | Boundary, topographic, vault, roof, and utility survey of school parcel and building for drainage remediation in NYS State Plane and NAVD 88 Datum. PS 56, Bronx, NY | Boundary, topographic, vault, and utility survey of existing building and 160,000 SF area for design of an addition in Bronx in Coordinate System and Bronx Borough Datum. PS 70, 30-45 42nd Street, between 42nd and 43rd Street, Queens, NY | Boundary, topographic, vault survey, and digital level run of a 6-story building, 200’ x 300’ parcel, and immediate adjoining areas for proposed addition produced in Queens in Coordinate System and Queens Borough Datum. PS 360X, 2880 Kingsbridge Terrace, Bronx, NY | Boundary, topographic, vault, and utility survey of school parcel and building, and a ¼ acre portion of an adjoining parcel for drainage remediation in Bronx in Coordinate System and Bronx Borough Datum. PS 64M, Manhattan, NY | Boundary, topographic, vault, and utility survey of existing building and immediate area for a “green roof” project in Manhattan in Coordinate System and Borough Datum. Charter School M, Manhattan, NY | Topographic, vault, and boundary survey of existing building and parcel abutting West 43rd Street and West 44th Street in Manhattan in Coordinate System and Manhattan Borough Datum. Junior High School 168, Queens, NY | Topographic, vault, and boundary survey of existing building and 3.3 acres of abutting parcel located on 158-40 46th Road, encompassing the entire block between Parsons Boulevard and 160th Street in Queens, in Coordinate System and Queens Borough Datum.